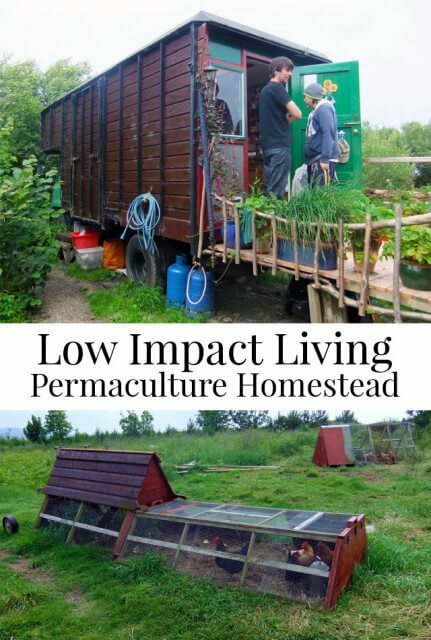 A tour of a low-impact homestead and learning about how it’s been designed using permaculture zones. On the second day of our ‘Introduction to Permaculture’ course our two instructors kindly brought us to the home they share with their two children. Over the last five years Amanda and Jim have built an amazing complex of shelters, growing spaces and recycling areas peppered throughout the wilder areas of their thirty acre plot. Though they make use of quite a lot of space, most of the land is left as ‘Natural Unmanaged Environment’ as is taught in the Permaculture Zone System. Leaving land for nature to thrive on is a guiding principle of living life in a more sustainable manner. Through Amanda and Jim I learned that Permaculture Zones provide a backbone from which you can create your own designs – whether it’s your home and outdoor space, a workplace or even entire communities. These zones are essentially a collection of inter-related physical areas and services that help create a functional system. As Jim writes on one of his information sheets ‘Zones can help to achieve efficient and effective designs’ – whether it’s on a small and personal scale or in large, communal spaces. The illustration above provides a better understanding of what the zones are. Imagine that you and your family are standing at the centre of that illustration – you are the first zone. As the centre and integral point of the system you have the power to make changes to your environment (i.e. the other zones) to suit your and the land’s needs. One example Jim provides is “We want a space for the children to experience nature through play”. From Zone one I imagine that you would make a list of all the types of needs which can be addressed in your system from the perspectives of everyone in your family and encompassing all of your physical zones. Moving further out in the diagram Zone 0 would be your home and Zone 1 refers to areas that need continual observation and frequent visits. For example a vegetable and herb garden makes sense to be placed near the house for better access from the kitchen. 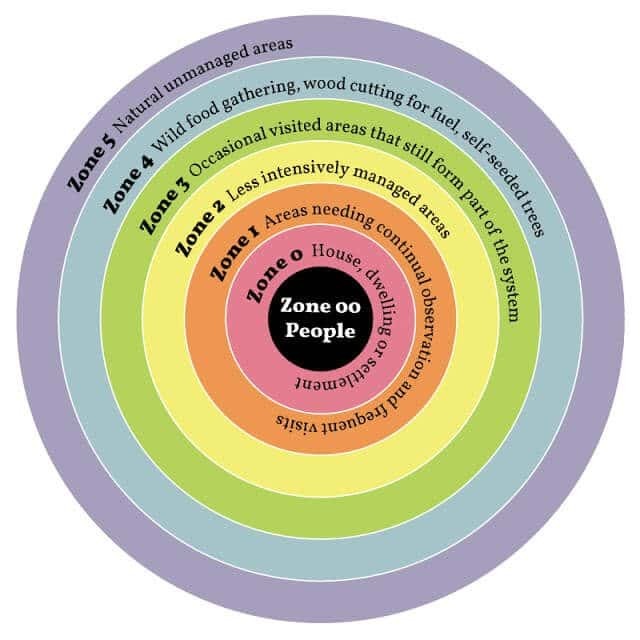 Zone 2 includes less intensively managed areas such as your compost pile and orchard and Zone 3 refers to occasionally visited areas that still form part of the system. This might be your well, a wind turbine, boundary fences or even structures like smoke-houses. Zone 4 is entering into an area that is less developed by people and left more for wild food collection, firewood and self-seeded trees. Finally, Zone 5 describes a part of your land that is left undisturbed so that wild animals have a place of their own. One of the most important things about the zone system seems to be making sure to create a balance between your zones and to create links between them. I understand this through examples such as food waste being recycled in zone 2 and then brought into zone 1 for use on the garden. Another one would be creating energy within your zone 3 to be used in the home. These could include but are not limited to wind turbines, coppiced willow for firewood and water powered generators. The goal is a self-sufficient system that minimises waste production and need for outside services, energy and materials. By visiting Amanda and Jim’s home we were able to see the zones system used in practical application. The combination of Permaculture values, principles and zones could become really confusing and I really don’t think I’d have been able to ‘get it’ were it not for these invaluable field trips. First stop on the tour was their wind turbine which was speedily zipping around in the breeze. 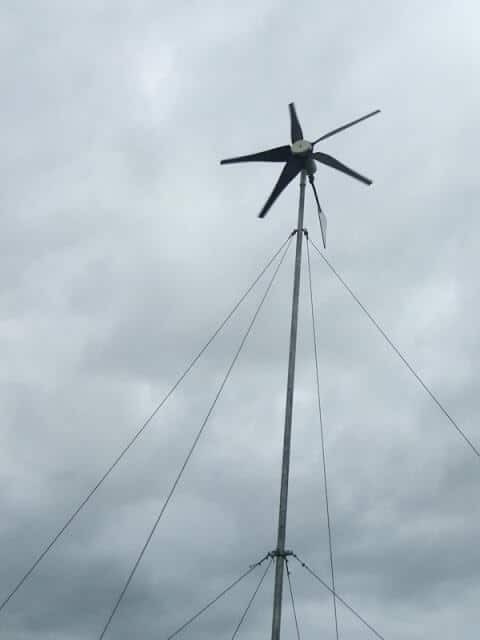 This wind turbine creates electricity that is used to power electric bicycles, charge up garden tools and to power the home. 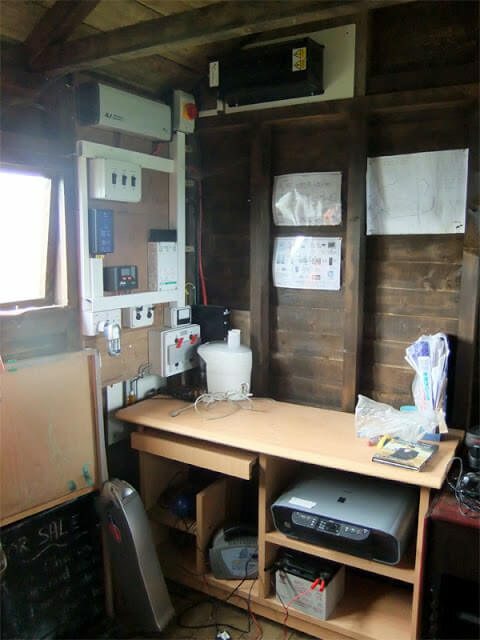 The electricity is managed through a mini power station in an outlying shed and excess power is used to charge eight large batteries – about the size of a car battery. Because Jim and Amanda live off-grid they choose to purchase electronics that can either be charged up or which run on batteries. Any items that require a conventional plug and 240 volt electricity can be plugged into the outlet on the wall of the shed. In a grassy area just outside the shed are two chicken tractors. 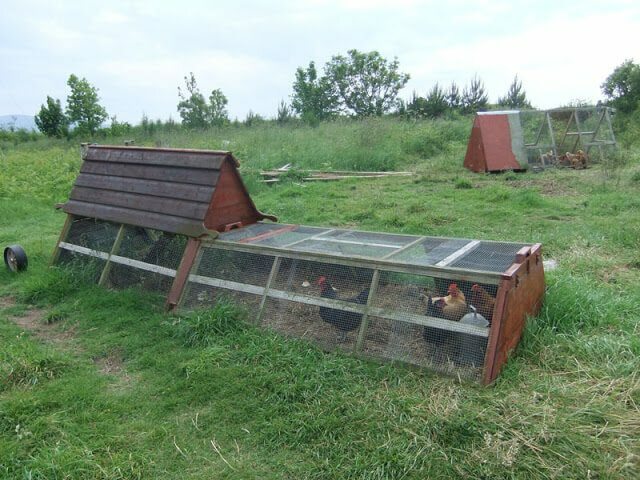 These are mobile chicken pens that allow the hens to scratch around in the fresh grass and help till the soil. I’m not sure what the plans are for this area but the hens will certainly help prepare the soil with their natural ‘fertiliser’. The fresh grass and insects they eat also help make delicious fresh eggs for the family. Near the hens and the turbine you’ll find the polytunnel where Amanda grows a variety of vegetables and herbs, most of which are destined for her family’s dinner table. This warm interior space also doubles as an area to dry clothing and food and as additional space for guests to sleep in. 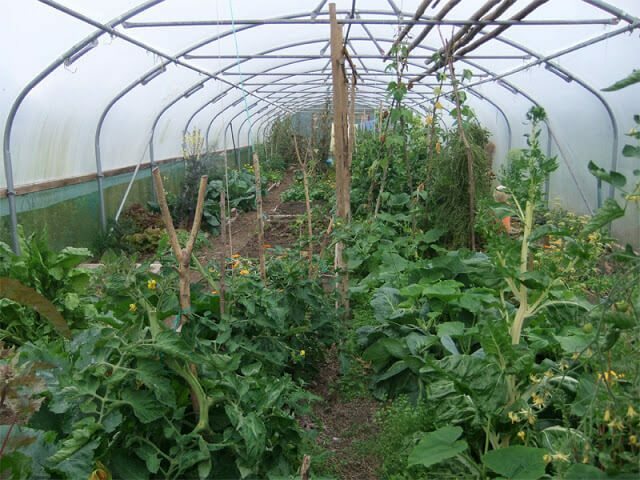 Hardier perennial and annual crops are grown outside the polytunnel in Amanda’s garden. Onions, cabbages, greens and flowers are all grown together in a way that might seem foreign to some growers. Instead of tidy neat rows of single crops, bunches of several types of specifically chosen crops are grown together. 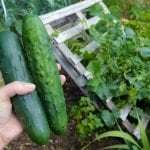 Companion planting is a technique that’s highly practiced by Permaculturalists and its effectiveness is best seen with Amanda’s cabbages. Though they aren’t protected in netting there isn’t a single sign of cabbage white (butterfly/caterpillar) damage. This is due to her growing a sacrificial crop, Orach, and a deterrent plant, Calendula, surrounding the leafy brassicas. I even had a nosy inside the cabbages to see if I could spot any slug damage and was surprised to find none. This is organic gardening at its best! 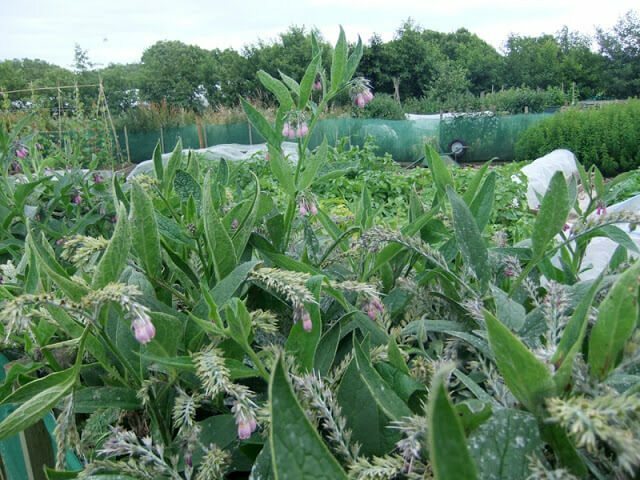 Another effective organic gardening technique practiced in Permaculture is using Comfrey, especially the Bocking 14 variety, as a source of nutrients for growing plants. The leaves and stalks of comfrey have a good amount of nitrogen in them but a much higher level of potassium. 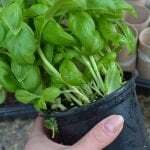 Therefore using them as a mulch or in liquid feed greatly stimulates fruit and flower production on all your garden crops. Altogether the turbine control-area, hens and growing spaces are in an area that could be considered Zone 1 and the turbine itself is probably Zone 2. Each of these areas produces energy and food which will be shared among the various zones but particularly with the family who consumes a lot of the food and electricity. Each of these areas produce a lot of outputs that are used and recycled within the system. After the initial set-up the inputs needed from outside the farm are small and may be limited to manure, some seeds, and the natural power of the wind. Outside the areas dedicated to annual crops are also spaces created for perennials such as orchard. Growing plants that produce food year in and out with very little work required is one way that you can increase your yield while saving time and energy. 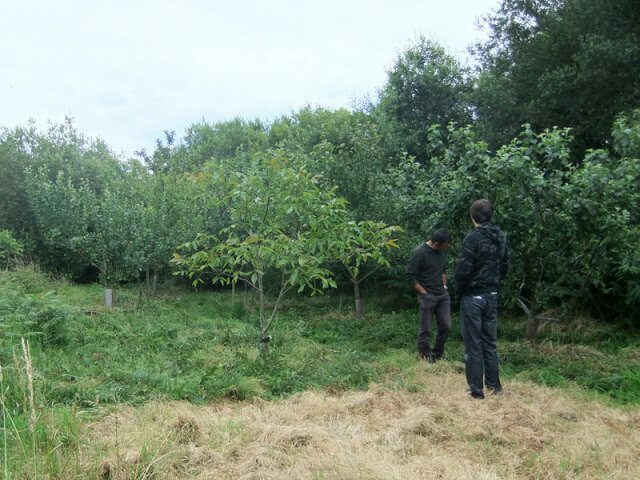 Amanda and Jim have put in an initial investment of various fruit and nut trees in addition to soft-fruit bushes and are now able to harvest an incredible amount of food in addition to the crops grown in the garden and polytunnel. They also were discussing the possibility of planting a Permaculture-style ‘Food Forest’ during the tour. 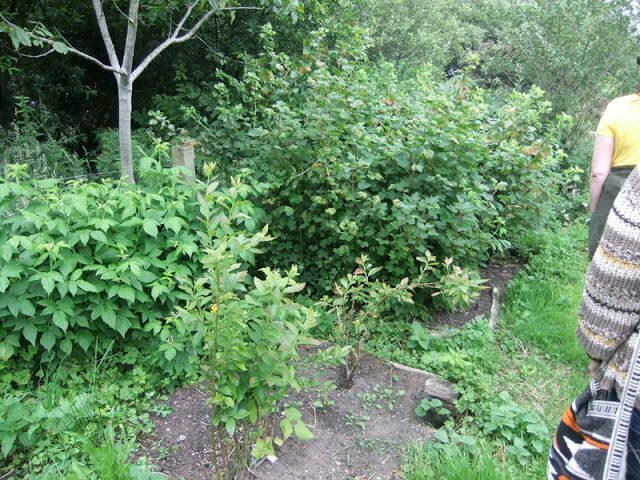 A food forest is a managed area of woodland which includes fruit and nut trees in addition to perennial vegetables, herbs and other low-maintenance food crops. During the class we watched a film put together by Bill Mollison, one of Permaculture’s founders. 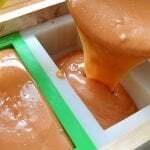 In it he introduced the intriguing idea that “Pollution is just unused waste.” This implies that any type of natural waste could be turned into a resource, even human waste. 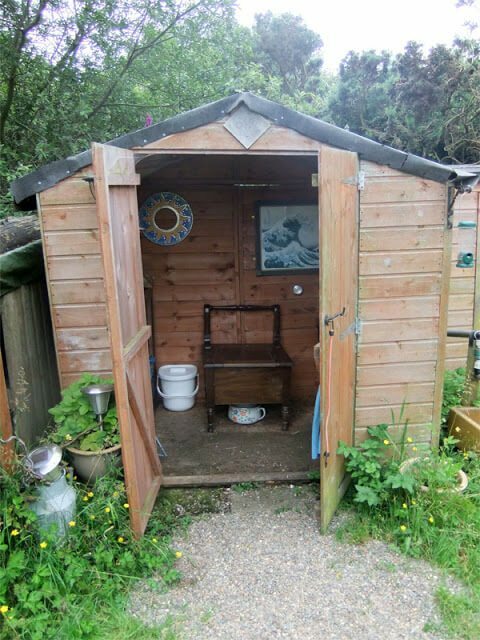 Though most people may be reluctant to compost and use their own waste in the garden, Jim and Amanda have set up a composting toilet system that converts excrement that would have otherwise been flushed down a toilet to rich compost that they place around their fruit trees. Here you see another link in their Permaculture design that turns output from one zone into an input for another. Many of us especially in this day and age are faced with enslaving mortgages and with jobs we hate just to pay the monthly premium. This is in contrast to Jim and Amanda’s belief that a home should only cost the amount of money you can make in two to three months time. Several years ago Amanda sold her conventional townhouse and used the proceeds to start her new Permaculture home. 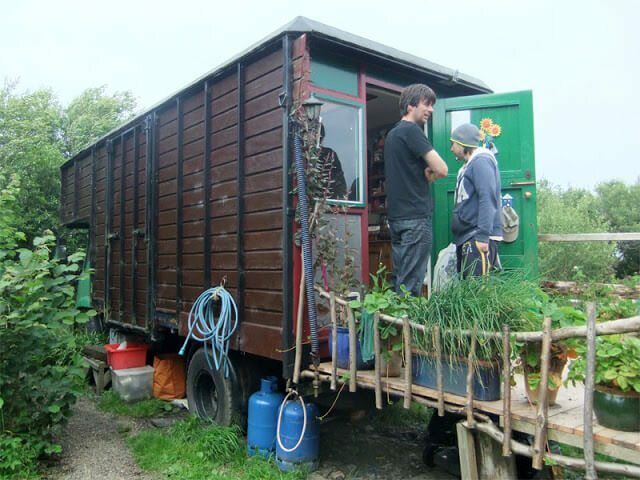 A horse-box was converted into half the home, which houses a bijoux kitchen, storage area and a double bed. 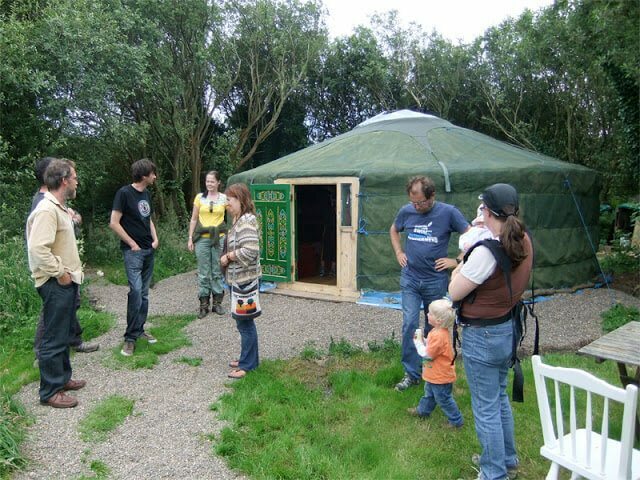 The second part of the home is a Mongolian yurt that is used for sleeping and eating, especially in cold weather. The outdoor space between the two structures is their living area which is complete with places to sit and dine. You can’t help but feel part of nature when you visit their home. Visiting Jim and Amanda’s set-up was the perfect way to end the class. We learned about the basic fundamentals of the system and then got to see them practiced in the real world by our instructors. We were also able to contrast their own practice of Permaculture with that of Paul Crocker, who has a much different implementation. It just goes to show that you can successfully use the system’s values and principles in many different ways. I’ve learned in the class that it’s possible to live a simpler and sustainable life without having to win the lottery first. Through conscious and intelligent design it’s possible to create a self-sustaining system that provides bounty for yourself and the planet without costing an arm and a leg. I’m pleased that I was able to attend the course and can say it’s really changed my perspective on both growing and living. 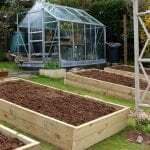 I can’t wait to begin assessing my own much smaller space and look for ways to optimise it the Permaculture way. Two to three months of salary for a home? How? Couldn’t buy a parking space for that! I find it frustrating that articles like these never talk about how the people involved got their thirty acres in the first place. Did they use to own a home? Did they leave high pay jobs in the city? Are they based somewhere so remote that land really doesn’t cost anything? 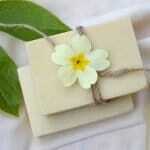 I've just linked to your pictures, hope you don't mind. Thanks now, great blog mate. Tanya I have read this post again. So full of information hard to take it all in in one go. Very interesting. I would have loved a trip to somewhere like this. 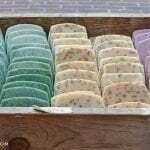 I love to nosy in other people's homes, especially slightly unusual ones, and I always learn so much from other people's ways of growing food. I think permaculture is something folks still have trouble understanding, this is a really good demonstration of it. Thanks Tanya. the phrase "sitting on the throne" is true! The google map is a wee bit out of date – where's the shed & turbine! Funny how things can change so quickly! I've got one of the allotments there and we all share things, whether it's tips, information, manure, food, flasks or tools – I love it! 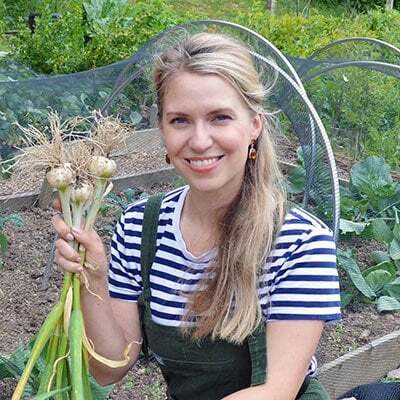 Very interesting Tanya – but it does seem that you have to have a lot of land to achieve these results – how does it all translate to an average garden. I could imagine living like that however the only thing that would bother me would be the toilet. I think it is an amazing achievement. Neat to see–I love some of their ideas. Good to see another convert. 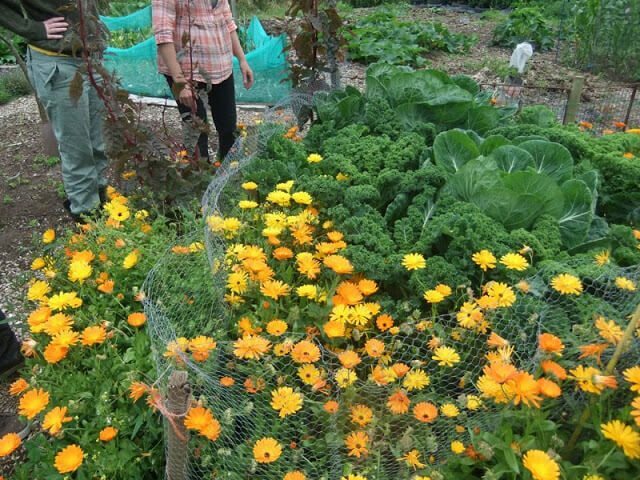 Looking forward to hearing more about how you are going to implement permaculture on your plot!